Hey there strangers! I’ve missed you! Right now I’m at my parents house in Ohio cuddled up in bed with my cats. I only have 2 more days left with them before I leave for China and I am going to love their faces off while I still can. It’s been a pretty traumatic couple of weeks for them so I think they’re appreciating this cuddling down time. 2 weeks ago Tiffany flew home with my sister. Then Biggie had to adjust to her being gone and I moved everything out of the apartment and she was really not happy about that. Then, 1 week ago Biggie flew home to Ohio with me. Once in Ohio I expected a beautiful reunion between the 2 of them but that just didn’t happen. Instead Biggie hissed at Tiff and Tiff sat there with a sad look on her face and it took 3 days for them to get back to normal. It didn’t help that there are 2 other cats in my parents house so tension is already high and they have basically been locked up in my room for the past week. But today’s post isn’t just about cats. I also have a recipe to share today. (woohoo!) I made these potatoes a few weekends before the mass craziness of moving ensued. 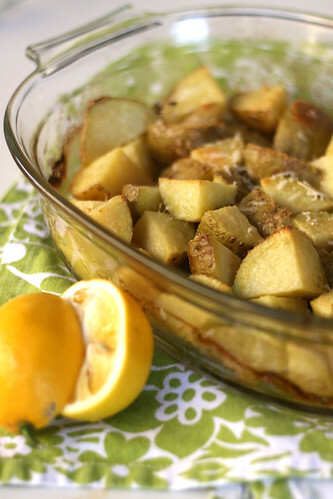 Lemon Garlic Potatoes are a great way to add variety to your menu by taking a break from your usual side dishes. They come together quickly, require minimal work, and I love the subtle but fresh flavor of the lemon. Plus, it’s nice that the ingredients are all things that I usually already have on hand. The baking time is a little longer than some side dishes, but since that time is basically hands off you can work on the main course or just sit back and watch and episode of FRIENDS. 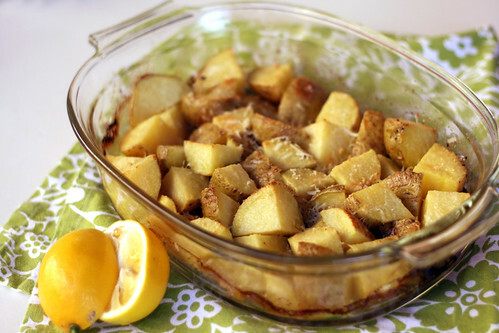 In a medium baking dish, toss the potatoes with the melted butter, garlic, and salt, then drizzle with lemon juice. Cover the baking dish with aluminum foil and bake for 35 minutes. Remove the foil, sprinkle with Parmesan cheese and bake for another 15 minutes, uncovered. When they start to turn golden brown and are fork tender, they are done.